Permanently soft gel coating for all metals. Will not evaporate. Lanolin-based coating. Solvent free. Non-toxic. 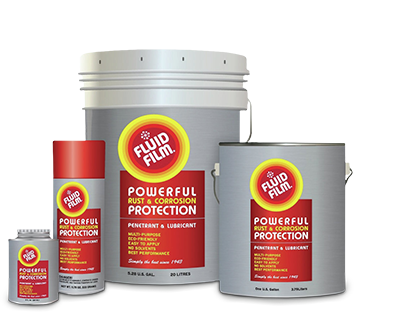 Anti-corrosive coating for all metals. Protects against attack by moisture, salt solutions and atmospheres in marine, agriculture and industrial environments. Applications are made in a single coat to ballast tanks, void spaces, pontoons, etc., on both new and old constructions. For use on equipment requiring protection from corrosion for extended periods. Not recommended for extended exposure to bright sunlight. For these applications use FLUID FILM GEL BEW (Exterior). See Technical Bulletin #202.3. If conditions dictate a heavier or lighter coating or lubricant, refer to other EUREKA CHEMICAL product bulletins for semi-liquids, gels and greases or consult EUREKA CHEMICAL COMPANY. New Construction: No sandblasting required. Remove any loose mill scale. Welding flux residues must be removed by wire brushing followed by washing with clean water. Clean up all debris. If surface has been shop primed with inorganic zinc, do not coat until the zinc has been cured a minimum of 30 days. In Service Equipment: No sandblasting required. Remove flaking rust and peeling paint. Break all blisters larger than 25 mm (one inch). Remove all standing water. Clean up all debris and silt. May be applied over tightly adhering rust. Residual coal tar and asphalt coatings must be removed to leave a thickness of no more than 50 microns (0.002 inches). If surface is heavily scaled, consult your Eureka representative. For further details, see Technical Bulletin #202.4. 170m 2 (1,833 ft 2 ) at 1.23 mm (48mils) thickness for new steel. 146m 2 (1,571ft 2 ) at 1.44 mm (56 mils) for rusty steel. On very heavy rust, visual inspection is required for best thickness recommendation. When spraying use approved eye protection to safeguard against potential eye contact. Use respirator or gas mask with appropriate cartridges and canisters (NIOSH approved, if available) to remove oil mist. If making repairs by brush, a respirator is not required. White: 2.5YO / 2 or lighter. 96°C (205°F). This value is given for information purposes only and is not to be construed as a recommendation for maximum temperature use. Oral: LD 50 greater than 16ml / kilogram (relatively harmless). Skin Irritation: Score 0.83 (minimal irritation). Title 16 CFR Section 1500.41. Eye Irritation: Negative. Title 16 CFR Section 1500.42. Note 1: When welding in tanks coated with FLUID FILM, wipe material back a distance of 1.5 meters (5 feet) from where hot work is to be performed and from the deck area beneath the hot work. See Technical Bulletin #202.2. Note 2: If FLUID FILM is applied over metal covered with scale, even though tightly adhering, anodes must not be present. If the anodes are not to be removed, then the surface must be cleaned to conform to Steel Structures Painting Council SSPC-SP3. Note 3: Maximum usable temperature is 65°C (150°F). Ballast tanks should be filled with water 4 to 5 days before hot cargo taken on in those cargo tanks that are adjacent to ballast tanks. All components of FLUID FILM® GEL BW & BN are listed on the TSCA Inventory.